The Motorola DS4208 general purpose imager delivers the blazing speed typical of laser scanners on both 1D and 2D barcodes, accommodating 2D barcodes without sacrificing scanning quality or performance. 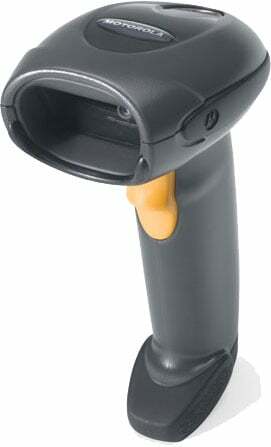 Users never need to take time to align the barcode with the scanner or pause between scans. Since the DS4208 can scan barcodes printed on paper labels or on mobile phone displays, users can drive revenue by attracting the millions of customers who are using their cell phones to better manage their lives. Retailers can accommodate customers who download mobile coupons, mobile loyalty cards and more. Quick service restaurants can accept mobile coupons at the register. Hotels can allow guests to use electronic loyalty cards stored on their cell phones, eliminating the need to carry physical cards. And since theaters, theme parks and stadiums can scan mobile tickets as easily as a paper ticket, they can offer customers an added convenience: paperless ticketing. Works fantastic - easy to program as well. The Motorola DS4208-SBDU000ZWR is also known as MOT-DS4208SBDU000ZWR	or DS4208SBDU000ZWR	.